Description:- Ibugesic 400 mg tablet is used in fever, headache, arthralgia, myalgia, dental pain, post operative pain, pain during menstruation, osteoarthritis, rheumatoid arthritis, ankylosing spondylitis and gout. 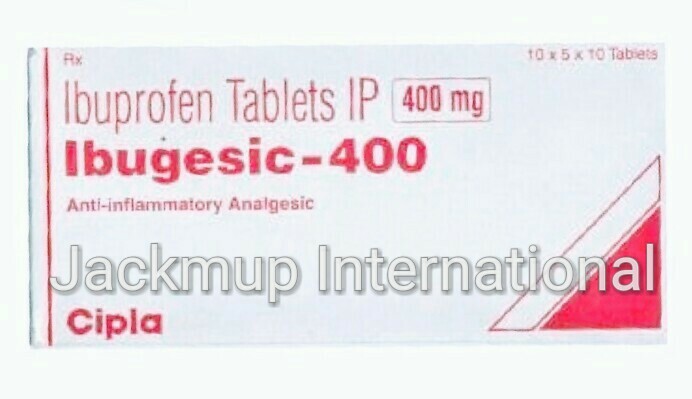 Ibugesic 400 mg tablet is a non-steroidal anti-inflammatory drug (NSAID). It works by blocking the release of certain chemical messengers that cause fever, pain and inflammation (redness and swelling). Take the drug with a meal or snack to prevent upset stomach. Do not take the drug with other blood thinners like aspirin unless your doctor suggests. Ibuprofen can cause easy bruising or bleeding, consult your doctor if you show any such signs. Consult your doctor if you develop blurred vision, ringing or roaring in ears. Avoid taking alcohol, salicylates to prevent bleeding. Do not start or continue the ibuprofen tablets: If you are allergic (hypersensitive) to ibuprofen or any of the other ingredients of ibuprofen. Doctor’s advice should be considered before taking ibuprofen tablets in case of any following disease conditions such as: Severe liver or kidney problems. Heart failure or other heart problems. Stomach ulcer, perforation or bleeding due to NSAIDs. Systemic Lupus Erythematosus (a condition of the immune system affecting connective tissue resulting in joint pain, skin change and disorders of other organs).